Digital Kindergarten: iPads in Kindergarten? YES! I'm a little surprised by how many negative articles I've come across this week about the school district in Maine that is going 1:1 with iPads with their new group of kindergartners. Yes, iPads belong in Kindergarten. I've been working with young children since I was 12... I started teaching in Early Childhood Education when I was 20. I used technology as a child- record players as a very young child, BETA and VHS VCR, Prodigy internet, CD players... yes I'm that young. I used computers in my first teaching position with preschoolers. I have always welcomed new technology. NEVER have I seen technology like the iPad that is so perfect for young children or the classroom. It's durable (and frankly, my kindergartners treat our iPads better than the high-school kids do), intuitive- they use it instinctively and more proficiently than many adults!, and such a powerful teaching tool in one small package. Yes, the teacher still needs to carefully train the students on proper care and use of the iPad- just as they do of markers, playdough and paint. No, the iPad will not replace the teacher- after all it's their duty to decide what the child will do with the iPad, which apps are best for each child and how they will be used or not used throughout the day. 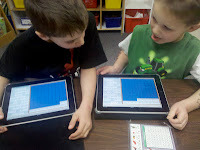 The iPad is simply an All-in-One device for kindergarten, much like the AIO printers have been to offices. The iPad is a library, a writing center, access to the world via FaceTime and email and internet, a listening center, a math manipulative, a science book, a workbook, an art station, musical instruments and so much more. With the littlest learners, teachers have to be everything at all times- mother, instructor, nurse, musician, artist, emergency responder, all the while planning and preparing lessons that engage kids who've just stopped taking naps (and those who fall asleep at the tables), meet a wide range of developmental needs (kids who should be in preschool and those who are ready for first or even second grade), reassure parents.... I could go on and on and on. Most importantly, kindergarten teachers are expected to teach kids skills that used to be expected out of first graders while maintaining developmentally appropriate practice- and for most kindergarten classrooms- in HALF a day! The iPad IS a MAGICAL device for children- and their teachers. It can be tailored to provide learning, practice, and reinforcement of activities at EACH child's own developmental level. It gives teachers more TIME- the device turns on quickly and most apps literally in seconds. It reduces the need for multiple CD players, computers, flashcards, and many manitpulatives. Most importantly to me is the instant feedback the children receive as they work. Take the Montessori 100 Board app for instance. I used to pass out a 100 board and 100 number tiles. The tiles would get mixed, students would be missing certain numbers, one bump and the tiles would get knocked off and the child would cry and have to start over. I would try to get around to children to help and correct- but often I would arrive to find the child had numbers upside down, a 35 in the 53 spot, and no clue what the name of the number was. NOW, with the iPad- they simply tap the app, and begin working- with all the tiles, with the number announced as they touch it- thus teaching the number name. It doesn't let the wrong number be placed, and has various levels of difficulty for the varied needs of students. I hope that more and more districts see the value of a device like the iPad. I hope the people speaking out against it would stop being jealous and try to actually consider the difference that could be made in just one child's life as a result of an iPad. In my classroom, children who could care less about behaving so they could play at free choice time CARED and changed their behavior when I announced that they wouldn't have a turn on the iPad if they had misbehaved. The kids CHOOSE to do the learning apps during a time when they could play with anything in the class- even over "noneducational" apps. And while they use the iPads, I can speak 1:1 with a child, I can work with a small group on reading or writing or math skills. I can actually teach children- not just monitor more than 20 5 year olds, pass out materials, try to differentiate, and catch when kids don't pick the correct answer. Yes, the iPad is MAGIC and it definitely belongs in Kindergarten. I just discovered your site while working on a grant to try and get some iPads for my reading room. I work with Kdg-2nd graders. I use iPod Touches but find the screens are often too small for their little fingers. Do you try to find apps that give you feedback on the student's progress or do you not worry about that? Thank you for app reviews they will be very helpful. Thus far I have not worried as much about apps that give me feedback. If I get to a 1:1 model that would be lovely, but at this point I utilize apps that are good and preferably free more than whether they have reports for me to view. Apps that I can think of that utilize reports for parents/teachers are the Teach Me: K/1st series, there are apps affiliated with Smart Tots like ABC smart (although none of them are ones I love-yet) that send reports to the parent/teacher too. I agree about the size of the ipad vs. ipods... for using them as books and writing tools the bigger size is better. Good on you for making us all aware. I too use technology with my Kindergarten in New Zealand and have been using it with the children for many years. We have been using iPods for the last year and a half and have found it as a great tool for the children to explore with. Here is an article of TEchnology that was written last year. Sue, Great post! I just found this post and I am dealing with some of these issues. I am about to get iPads for my class as part of a district grant that I applied for. I am stunned by all of the naysayers. BUT I truly believe my students will flourish using iPads. Thank you for sharing your wisdom! I was so lucky this year to have a parent buy my classroom 2 iPads. I cannot imagine not having them in my classroom. I love them and so do the students. Every child in your class has an iPad? Did the parents have to buy them?